NOTE: What an honor to have a chance to play with such talented, dedicated and creative players and GM! After being summoned to the tower of the Locust Mage Anaxamon, these five legendary mages are informed that they are needed to stop the Traveler, a mysterious force that is about to obliterate their entire plane of existence. Anaxamon then disappears and freezes the Council in a Level 5 suspension spell for weeks, going off to obtain the Tesseract Dagger, a device that unmakes objects and even planets. Eventually the Council is able to free itself with the help of Ingara’s brethren. Through a portal and some scrying, the Council discovers that the immortal elder dragon Durathrax, who in this time has a wingspan of 600 feet, has destroyed Iradrum. A sole messenger, the dwarf Mortimus, escapes the carnage through the portal and joins the mages Council, but must stay behind to recover from burns. Mortimus carries with him a tome that describes the pact that Anaxamon made with Durathrax: that Anaxamon may never attack Durathrax. An important caveat is that if Anaxamon dies, then Durathrax would be severely weakened. The devoted dimensionalist Olfan creates a Portal to the location of Anaxamon, who was scryed streaking across to the Astral Plane. The Council arrives at the location of Anaxamon to seek further instructions. They immediately realize that they are on the back of the elder dragon Durathrax herself, who is flying 400-500 mph towards a pocket dimensional sphere floating in the middle of the Astral Plane. Hinar enters the mind of Durathrax for one round, understanding intimately that she is full of hate and intends to enter the spherical dimension ahead in order to find and kill the Traverler. The great wyrm bucks while Anaxamon inexplicably attacks the Council, saying that it’s the only way. Zeke succumbs to wounds and falls off the back, as Olfan is also bucked off but catches the tip of her tail. Ingara engages with Anaxamon as Iron Gut transforms into a bird and dives to rescue Zeke. Olfan portals himself onto the back of Durathrax once again. Durathrax bucks again, even as Anaxamon tirelessly attacks. Then the dragon and her passengers enter the spherical dimension. The dragon is nowhere to be found in this new area. Her passengers Ingara, Hinar and Olfan find themselves upon one of four floating platforms of crystal connected only by giant incubator tanks filled with hostile astral worms. In the center between all the platforms is a strange little wizard sitting atop a floating metal disc. The wizard talks about how the obliteration the current plane is necessary for reasons they would never understand. Then he disappears. Olfan jumps onto the metal disc, bumps into the wizard who was still there but invisible. 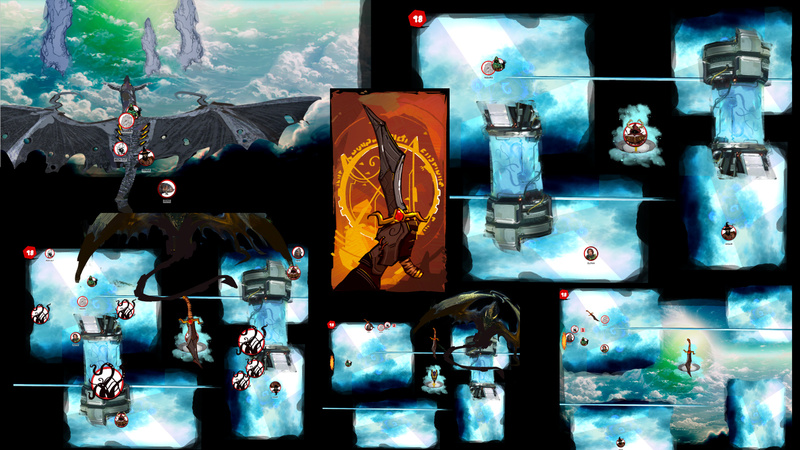 The wizard shoots Olfan across the map and multiplies himself into several doppelgangers around the map. Durathrax arrives at the platforms and conjures a giant version of the Tesseract Dagger that she wields. She tries to use the giant dagger to obliterate the wizard in the center, but fails. Half a dozen masses of writhing tentacles erupt on each of the platforms, besieging each of the three mages. Meanwhile Iron Gut administers potions and healing to Zeke in mid-air, and an awakened Zeke deploys a parachute. Iron Gut reverts back to bird form and Zeke hitches the parachute’s steering rigging to the large bird. Zeke then has a small monkey play on a small drum. Zeke and Iron Gut descend upon the scene of chaos. Durathrax is stabbing each of the Traveler-wizard avatars with her giant Tesseract Dagger spell, obliterating each one in turn. Ingara is holding off tentacles as best she can. Olfan fails repeatedly to plant an ice barrage bomb inside one of the tentacle incubators, and Hinar beats back tentacles. Zeke uses his Scrivener’s Kit to discern the spell that Durathrax is using to amplify the dagger. In his quick studies, he figures out that he needs the dagger itself. Through dashing wizardry, Zeke dislodges the actual Tesseract Dagger from the control of the gargantuan beast, sending the relic flying into the expanse of the open air. He then dives for it, deploying his ‘chute once more. This time he begins work on a turkey leg. Durathrax is flying about the room, and in one attempt to blast the Traveler, lets out a column of deathly fire that consumes Hinar and drops Olfan. Iron Gut, meanwhile, stuffs himself with spiny bullwort, undergoing a grotesque change within himself that saps all of his other attributes and lends him 17 to wisdom. His dwarven body is transformed into a bulging-headed, limping monstrosity of absolute casting probability. Anaxamon is informed by Zeke in mid air that Zeke can very well control the Dagger, and that Anaxamon didn’t have to trick Durathrax herself to destroy the Traveler with the Dagger. He casts a perfect rendition of Udin’s Hand and plucks both Zeke and the Dagger from the void. Olfan is ripped in half by the growing, creeping tentacles, which are occasionally being roasted into oblivion by the Flames of Durathrax. Iron Gut begins to put his grotesque brain towards the work of a Group Resurrection spell, taking on the task of working down 40 effort even as the session timer is set to five rounds remaining. Zeke finishes his spell learning and takes control of the Tesseract Dagger’s full strength. Within a single stroke, he obliterates the true form of the Traveler, which was a cold, heartless seraphim neither good nor evil. The room begins to break apart, and Durathrax is still with wrath. Anaxamon opens a Portal to his Shadow Tower, a way out for the remaining mages. But Iron Gut and Ingara are still working on the resurrection spell. Zeke threatens to destroy the Great Dragon with the dagger he now wields, and Durathrax lumbers off, her feeding grounds intact but her pride injured. With no rounds to spare, and yet 1-2 more rounds of research left on the Group Resurrection spell, Zeke casts a time-slowing spell, which damages the Session End Timer, affording barely enough time for Iron Gut and Ingara to complete their spell. They resurrect Hinar and Olfan, pulling them back from the brink against all odds. With no rounds left, all six wizards enter Anaxamon’s portal to safety. The Council discusses the prospect of sealing or hiding the Tesseract Dagger in both space and time. Iron Gut wishes to unmake the relic. But Zeke says that he would then no longer have any leverage over Durathrax, and that he must keep the thing locked away. Hinar returns to his ageless stasis chamber, more tired than he’s ever been. Olfan requests that Anaxamon return him to the Fifth Age of Grey, the end of the Third Age being the Scourge of the Snakemen, and the Fourth Age being the reconstruction. But Anaxamon says that he is no longer able, and that Olfan is stuck here, in the Fourth Age. Zeke invites all those remaining to sit by the fire, perhaps to stay a while, and listen. Gaaaaah! Such an amazing DM he is! Such an amazing group of players you are! I love the Deckard Cane reference at the end. I can’t wait to see what happens from here! Will a video of this appear on RFE? Perfect write-up, @Dave_Thaumavore! It was a session for the ages. I would just like to point out again that we did the majority of that nonsense on a target of 18. It was nuts.